I do not know, either. You don't know that either, Mr. Tic!? OK. I'll explain what all things are made up of first, and then tell you what plastic consists of. Please explain simply, Mr. Usukura. Mr.Tic, never say more than necessary. Mr.Usukawa, please start to explain. All the things around us are made of "atom". Are all natural things and artificial things made of "atom"? I don't think artificial things are not. No, Sae is right. Both of them are made of "atom". What do you call a thing that is made up of connected atoms? I know. It's a molecule, isn't it? That's right! You really know well, Sae. Then, do you know macromolecule? Some substances are made up of large molecules. Such molecules are called macromolecule. For instance, sugar and starch are made up of large molecules. Are plastics also made up of macromolecules? Mr.Tic, I am asking Mr. Usukawa. Plastics are made up of simple molecules, which are artificially connected repeatedly. So we call them synthetic macromolecules. 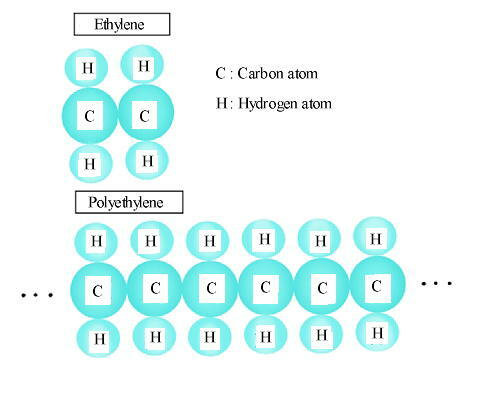 The figure below shows the structures of the molecules of olefiant gas and polyethylene polythene. Monomer ? Polymer ? Polymerization? Mr.Usukawa, could you tell us about polymer? You know, I explained macromolecule just now, but a thing made up of simple molecules that are combined repeatedly is called polymer. One example is olefiant gas. Let me explain with a figure. And I'll also explain polymerization. Suppose one car is a monomer. The long train made up of cars connected can be called a polymer. Mr. Usukawa, then, what is polymerization? 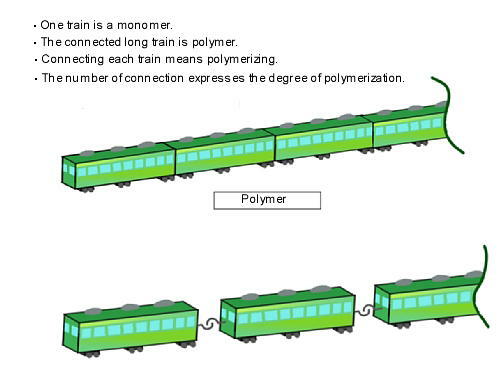 Polymerization means the connection of cars of a train, and the number of the cars shows its polymerization degree. What do polymerization and polymerization degree exactly mean? Polymerization means chemical change in which monomers connect one another and make into a polymer. In this figure, some cars, which mean monomers, connect one another and become one train. Remember, polymer is also called "Ju-gou-tai" in Japanese. Polymerization degree means how many times polymerization repeated. A polymer with large polymerization degree is also called high polymer. Why do plastic have many kinds? And why do they have different properties? Mr.Usukawa, could you tell us why? Have you guys understood the monomer and the polymerization degree? Sure! Mr.Usukawa, don't underestimate us. I'm sorry. Now, you understand them, so it's easy to go to the next stage. The first factor to determine the structure of plastic is its chemical structure of monomer. Plastics even made up of the same monomers are quite different in characteristics according to a number of factors, such as the polymerization degree of macro molecule and the way monomers are connected. That's why you can create plastics with various characteristics by combining various factors of monomers. Mr.Usukawa, we see many kinds of plastics round us, but could you tell us what kinds of plastics are used, and for what products are they used? You'll see if you look at the chart I made. Thank you!! You do a good job once in a while. Oh, you took my job, Mr.Tic. 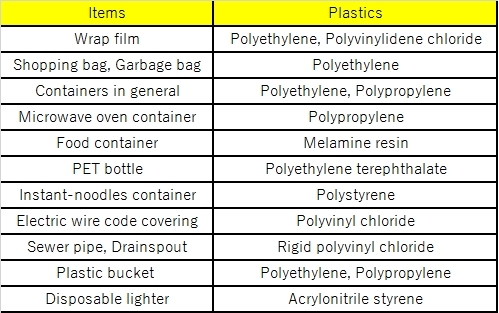 Let me show you some signs to distinguish plastics. Those signs are based on the "Law for Promotion of Effective Utilization of Resources." There is a sign that I might have seen before. The sign you usually see the one on the left side, isn't it? It means polyethylene terephthalate, a kind of plastic often used for PET bottles. This sign is called "the SPI code", isn't it? That's right. Plastics Industrial Association in America created it to encourage people to separate abandoned plastics, and promoted that idea. 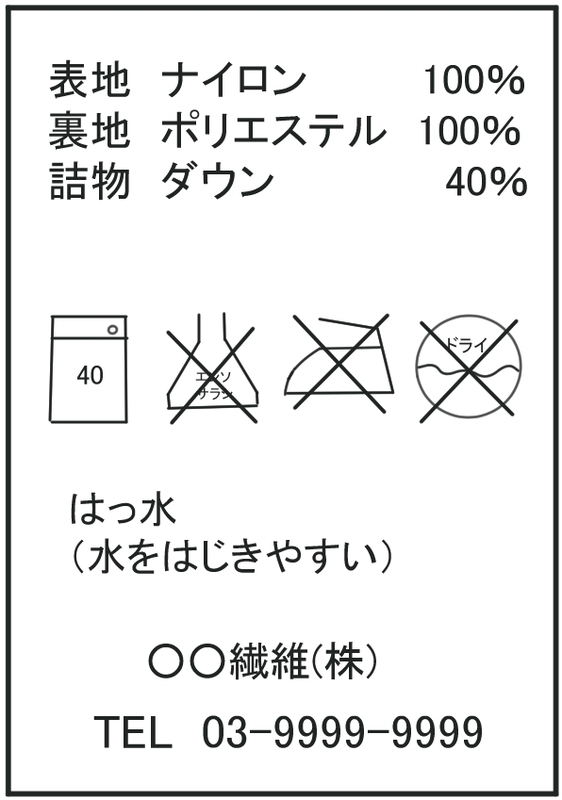 Japan also introduced the sign, right? But, when we purchase a product, it doesn't seem to be easy to tell its plastic quality. What do you think? 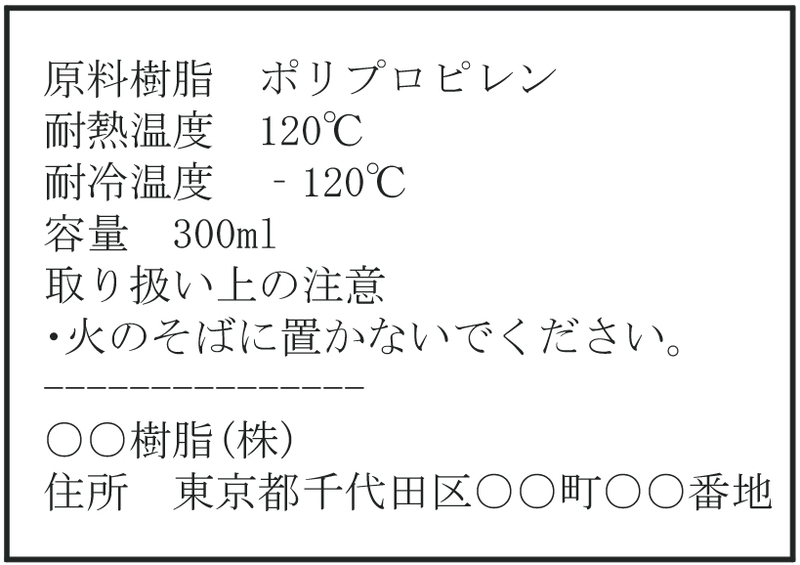 Well, in Japan, according to Household Goods Quality Labeling Law, it is obligatory to show quality of plastic used for goods, which are especially required to do so. It's just like you to show them to us, Mr. Usukawa.